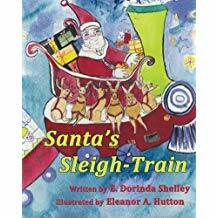 Readers of all ages will surely be delighted by the inspiring story in “Santa’s Sleigh-Train”. Through this wonderful Christmas tale, the author emphasizes the power of kindness, teamwork, and positivity in order to make things possible despite the challenges. The book tells a sweet and spirited tale that proves how kindness, selflessness, friendship, and teamwork can make great things happen. In her fourth children’s book, Dr. E. Dorinda Shelley shares valuable lessons that the young and the young at heart can keep. She makes this evident through her wonderful Christmas tale featuring Santa, Rudolph, and all the reindeer and elves in the North Pole. Along with that, she teams up with illustrator, Eleanor A. Hutton, in order to put color and life on the pages of this book. The spirited tale told in Santa’s Sleigh-Train unfolds when Santa discovers that his trusted reindeer, Rudolph, got sick with reindeer pox—on Christmas Eve, no less! Determined to find a solution to the crisis at hand, Santa and everyone else has to cook up a non-traditional way to deliver all the presents and still bring joy and happiness on Christmas day. Thankfully, he finds the answer through a toy train and some magic dust. Along with everyone’s help, Santa can finally carry on his great mission and save Christmas. Overall, this inspiring tale is indeed a perfect read especially since Christmas is just around the corner! Shelley’s wonderful Christmas tale will soon join the upcoming 2018 Miami Book Fair. Happening on November 11-18, 2018, Santa’s Sleigh-Train and many other titles and selections will be displayed and celebrated during this highly-anticipated event. So, do grab a copy and be sure to check it out! Dr. E. Dorinda Shelley is a retired dermatologist who now runs used bookstores and art galleries in Grand Rapids, Ohio. This is her fourth children’s book. Illustrator Eleanor A. Hutton is a graduate of Maumee Valley Country Day School and The College of Wooster, Ohio. Ms. Hutton has previously illustrated five children’s books, authored one and co-authored another.